JCE (Java Cryptography Extension) API (Application Programming Interface) spec from SUN (Stanford University Network). The implementation for USA is from SUN. The JCE comes bundled with Java version 1.4 or later. Note that PGP and SSH are not on the list. JCE is designed as a plug-into be replaced by a third party provider with additional protocols. For example, BouncyCastle.org add PGP support. Americans had a silly law that code written in the USA that does strong encryption cannot be exported outside the USA and Canada, even though the algorithms are published. This has had the effect of stimulating European and Australians to provide such software which is immune to the restriction, taking business away from American companies. It was repealed circa 2000, but various other countries have restrictions on importing full strength encryption. The JCE that comes with the JDK (Java Development Kit) is crippled. To get full strength encryption, you need to download and install the full strength extension. You can avoid this hassle. BouncyCastle.org is located in Australia. The ABA (Australian Business Access) provided a clean room implementation of JCE 1.2, including a cryptographic service provider, for international use. ABA seems to have disappeared. BouncyCastle, another Australian group, has a free cleanroom implementation of JCE 1.2.1. An Austrian university foundation with the unlikely name of SIC-IAIK-TUG (Stiftung Secure Information and Communication Technologies Institute for Applied Information Processing and Communications) has produced a large commercial JCE implementation that includes SSL (Secure Sockets Layer) and AES (Advanced Encryption Standard). You don’t usually use the vendor classes directly. You get at them using standard interfaces and String specifiers much the way you get at JDBC (Java Data Base Connectivity) drivers. However, the class files live in J:\Program Files\java\jdk1.8.0_131\ \jre\lib\jce.jar. You could put the jar on your IDE (Integrated Development Environment) ’s library path to use the classes directly. 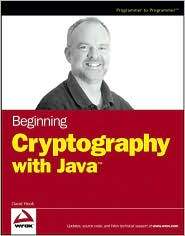 Covers JCA, symmetric and asymmetric key encryption in Java, message authentication codes, padding, ASN.1, certificate revocation, CMS, SSL and S/MIME and the BouncyCastle provider. Unlike many books on the subject, this one is rich with sample code.